With days–perhaps hours–to go before President Obama announces recommendations from Vice President Biden’s gun violence task force, battles lines have already been drawn. Most dramatically, with the heartrending burials of 20 innocent first-graders and six of their heroic educators as a backdrop, NRA top lobbyist Wayne LaPierre issued a belligerent and self-pitying demand for yet more weaponry, and the posting of armed guards at every school in America. But as the nation debates Obama’s proposals—and LaPierre’s—it will be important to reexamine the NRA’s greatest PR victory of the last few years: the greatly overworked, shamefully distorted Fast and Furious scandal. As Fortune reporter Katherine Eban revealed in an outstanding investigation published last summer, much of what Republicans have claimed about the scandal—including the headline-grabbing assertion that the US government intentionally provided guns to Mexican drug cartels—is false. The real story is of an agency sabotaged by the same pro-gun mania which led to the Newtown tragedy. The Federal Bureau of Alcohol, Tobacco and Firearms (ATF) opened up the Fast and Furious case to monitor American teenagers, who had been tapped by Mexican drug cartels to help arm the war in Mexico by becoming straw purchasers or front buyers. Our laws permit a teenager with no prior criminal record to pay cash and buy an unlimited number of military assault rifles. Their favorites included AR-15 variants like the Bushmaster .223 rifle used by Adam Lanza at Sandy Hook Elementary School. Were Lanza in Arizona, he could have walked into nearly any federally licensed firearms dealer, plunked down $10,000 in cash, and left with 20 AK-47s in his hands—as do so many straw purchasers. An e-mail from the head of the criminal division for the Arizona District US Attorney’s office makes clear that the Fast and Furious prosecutors believed that it was legal for a straw purchaser to buy the guns and then transfer them to others, so long as those people were not legally prohibited from possessing firearms. The Republicans have asserted the opposite—that if the straw purchasers certified in their paperwork that they were the true buyers of the gun, but then transferred it after the purchase, they were lying and should have been prosecuted. But the courts in Arizona have disagreed, and thus, so did the prosecutors. Agents protested these decisions repeatedly, but of course were required to abide by the prosecutors’ legal judgments. The result: a lot of guns wound up in Mexico, and two were found near the Arizona-Mexico border, where an elite US border patrol agent, Brian Terry, was gunned down. The Republican-led House, acting in lockstep with the NRA, twisted the facts of the ill-fated gun trafficking investigation in Phoenix to complete almost every item on its political To Do list. It used the scandal to bludgeon and destabilize the ATF, the agency charged with enforcing the nation’s gun laws. It diverted attention from the ineffective gun laws that made the ATF’s job in Fast and Furious nearly impossible. And it emerged with a cherished talking point: that the gun laws on the books right now are more than adequate, and it’s only their enforcement that has flaws. The effort by the NRA and its friends in Congress to stymie any discussion of our permissive guns laws during its Fast and Furious investigation was made plain by the lead sled dog, Chairman Darrell Issa (R-CA), who at multiple hearings openly silenced Democratic members from even asking questions about the strength of the laws or potential legislative solutions. If the NRA and Republican congressmen really cared about Brian Terry or his tragic death, they would have probed the actual causes underlying it, instead of proliferating a lot of phony conspiracy theories so wild, they almost left Stephen Colbert at a loss for words. Since the shooting, other media outlets have now written about how the ATF is fundamentally hobbled in its mission. On December 26, the New York Times reported on the warnings of advocates and law enforcement officials that “the agency’s ability to thwart gun violence is hamstrung by legislative restrictions and by loopholes in federal gun laws…” Of course, hamstringing the ATF has always been a prime goal of the NRA’s. What has always seemed breathtakingly hypocritical about Issa’s pursuit of the ATF in Fast and Furious, is the pretense that the Bureau actually had some other way to stop all those guns, but failed to do it. That’s simply untrue. Nothing makes this clearer than two different reports from the Justice Department’s Inspector General. In November of 2010, the IG issued a report (see page 51) saying that the ATF failed in its efforts to stop gun traffickers because it has pursued the little straw purchasers, while ignoring the larger cartels recruiting them. So the ATF did a course correction and started targeting the big guys. This time around, Congress (and the DOJ IG) blasted ATF for not pursuing the little guys (the straw buyers) more aggressively. With the restrictions and laws as they are today, there is actually no way for the ATF to succeed. Issa and the NRA love to pretend otherwise, so they can persist in the fiction that the laws are more than adquate. Sadly, the ATF, which is truly a broken agency, has been all too happy to play along. Most recently, ATF quietly withdrew its policy of targeting the cartels (which was a response to the first 2010 IG report). 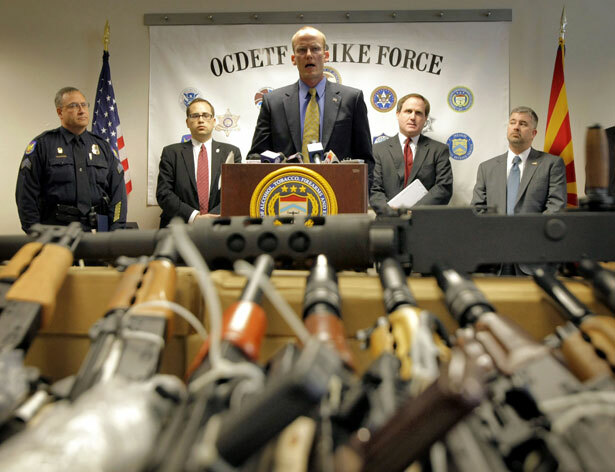 In a little-noticed memo issued late last year, ATF Assistant Director Ronald B. Turk informed agents that, “All policies and guidance set forth in that document are hereby rescinded.” That amounts to a quiet acknowledgement that there is no way, under current law, to stop the epidemic of gun trafficking which is at the root of the problem. Simply put, Fast and Furious would never have happened if we banned the sale of military assault rifles and cop-killing handguns, the weapons of choice for the drug cartels. It would not have happened if we made it illegal to transfer firearms to third parties, plain and simple. Early on in the investigation, the few reality-based ideas came from Representative Elijah Cummings, the Oversight and Government Reform Committee’s ranking Democrat. Cummings held a hearing on the state of the gun laws and issued a report with recommendations including the enactment of a federal firearms trafficking statute. But the 36-month Republican-led investigation into Fast and Furious yielded not a single suggestion for strengthening the laws or empowering the ATF. Instead, it was a blueprint for reducing what passes as gun enforcement to rubble. As we’re tragically reminded over and over, that comes at a tragic price. Is the tide finally shifting on gun control? George Zornick argues that new proposals have moved the debate left.